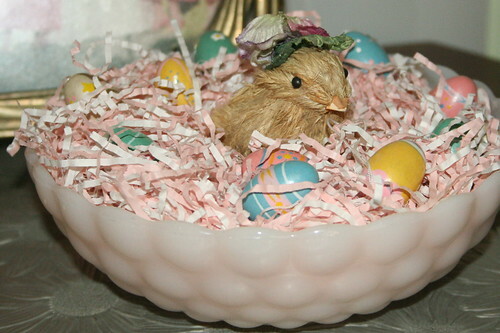 Well, actually it is already early Easter morning, but I have been having trouble sleeping, so I am up and online. 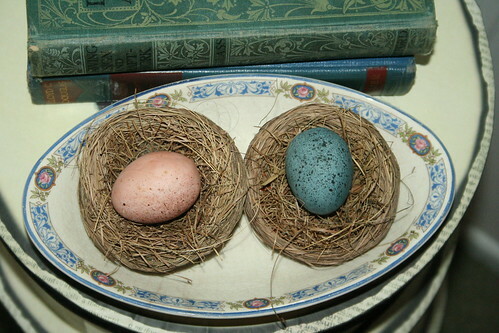 Since I can’t enjoy the Land of Nod, I thought I’d share a few photos from around the house that I took today. Quick disclaimer: To be my friend you will have to ignore dust, spotty windows and bad lighting. 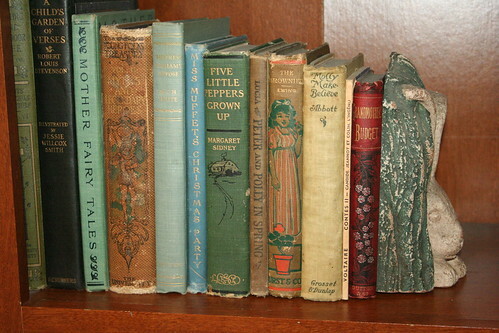 First is a shot of some of my favorite vintage children’s books with an old bunny bookend keeping them up. His tail is somewhere else in the house, poor little guy. Of these books, my favorite has got to be A Child’s Garden of Verses with illustrations by Jesse Willcox Smith. It is pre-1923, so I can share them with you someday, when I get a working scanner again. Her drawings are really magical, and they perfectly complement Stevenson’s poems. Another amazing book is Miss Muffet’s Christmas Party. You can check it out online at the Rosetta project’s website. Trust me; you want to find out who comes to her party. 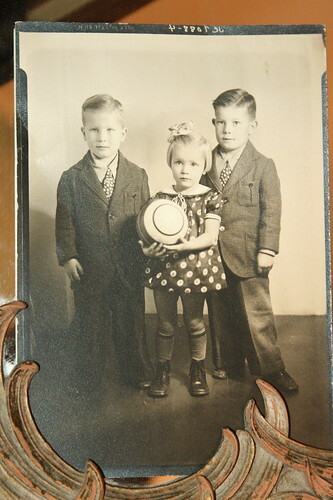 Next is a wonderful photo that I found in an old book I bought from the Goodwill. These little children are 2, 3 and 4 years old. How cute are they? Here are some vintage suitcases stacked up to form an end table. 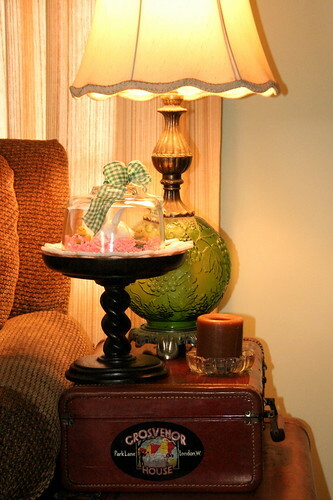 My lamp and a candle are fairly permanent fixtures, but for Easter, I added this Southern Living pedestal (one of very few full price purchases I have made) with a milk glass plate and a small cloche from the Goodwill covering a .30 cent bunny and two .25 cent chick candles. I went thrift shopping with my good friend Ellie, and she told me if I didn’t grab those candles, she was going to take them herself! 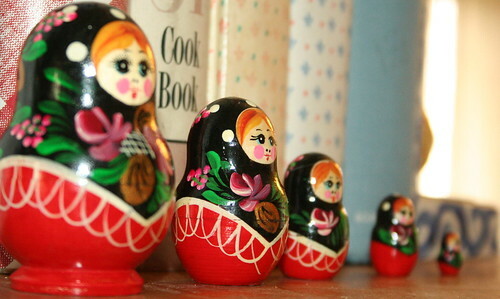 I recently found these vintage Russian nesting dolls at an estate sale, and I just love them. I found this tiny apothecary jar this week for $1.99 filled with fruit shaped soaps (now making my kids’ washups a bit more fun). I filled it with shells and beads and found it fit perfectly inside this 1920’s Egyptian style chalkware maiden figurine. I think she used to be a lamp originally. Poor thing has lost her nose, but it works for her Egyptian sister, the sphinx, so she is going to rock the look too. I think she does need a name, though. Any suggestions? 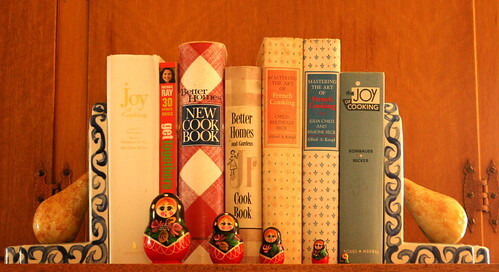 Last, I thought I’d catch a current shot of the ever-changing tableau above my kitchen sink. It is not exactly decorated, since half the items here are temporary, never meant to be here or need a little work. 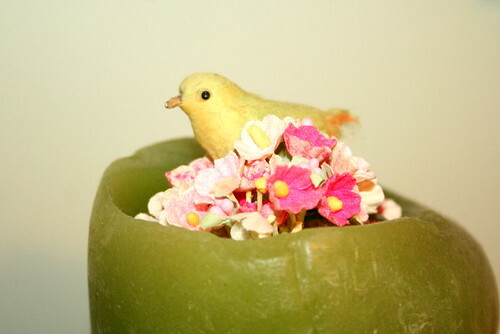 3) a Middle Eastern rose water shaker that my husband picked up in a thrift store (I’ve corrupted even him!). Would you believe I had a bottle of rose water in the cupboard that I had found on clearance at the market? So, if you come over, you can sprinkle your hands with fragrant water before we eat. 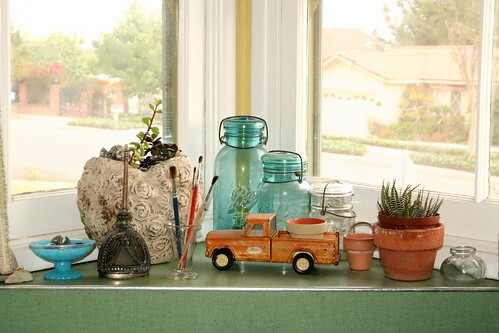 4) Behind the water shaker is a planter I won in a raffle, complete with succulents and little angel. 5) Next to the shaker is a vintage pharmacy beaker with some paint brushes my seven-year-old and I used for a school project last week. 6) Front and center is the .25 cent rusty, old Tonka truck I picked up at a recent garage sale. I put a tiny pot inside, and I fully intend to put a little succulent in it, but that has not happened yet. 7) Behind the truck are my trusty Ball jars. This little corner is one of my favorite spots in the house. It makes even doing dishes by hand (endlessly) seem bearable at times. Okay, I found one more shot on the camera. Don’t be afraid, but my house is haunted, and I got proof today. Sophia walked in to my room today and asked where Daddy was. 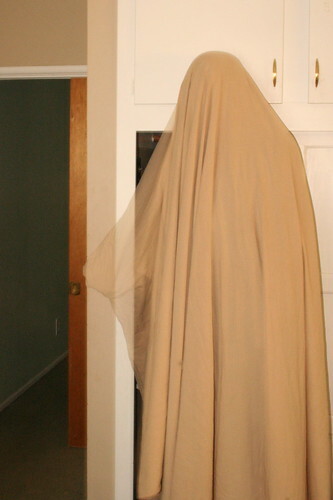 Of course, I said I didn’t know, ignoring the 6’5″ flannel-sheet-covered specter near the closet. Sophia said, “Okay,” and left the room, with a “Bye, Daddy” in parting. That kid cracks me up! And, boy is my husband weird! Of course, I wouldn’t love him so much any other way. 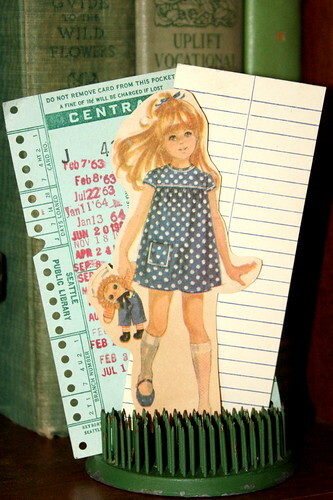 ~ by bekaboo on April 12, 2009. 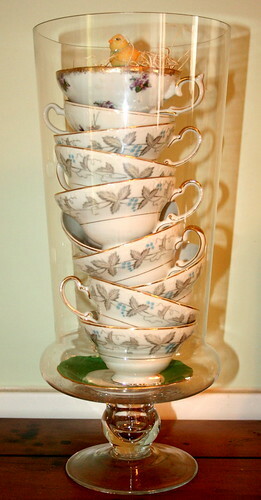 I love the teacups all stacked up- super cute idea! Thanks for cisiting our blog- we’ll stop back soon! Gosh you have a great eye for photography. I love all of these shots- especially the apothecary vessle. very cool. wow I would love to come and visit your house, the only problem is I don’t think you would invite me back cos I would be trying to steal all the cool goodies in your house. I just so wish we lived closer so we could thrist shop together, I need your eye and advice. Love looking at your photos. LOL at ya dh, too cute. As for brekkie, I tend to eat it more in the weekend ( although its more like brunch) during the week I dont eat brekkie and I know thats so wrong. Loved the gift you made for your next door neighbour and I am sure she will love it. 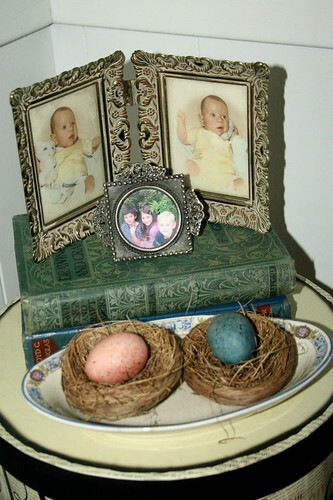 you have wonderful decorations throughout your house…love them! Thanks for stopping by my blog–it was such fun to discover yours. Anyone who loves a thrift store is good in my book! I loved seeing the school play pictures of your cute kids. I have twins (now teens) and they did some cute plays together when they were younger. I kinda miss those days–we are in full out prom preparation this week! I’ll be back to see what treasures you find at your Goodwill. You are kidding, right? If I had half of your talent at creating an atmosphere, I’d do it for a living. Your pieces are so tranquil and creative. 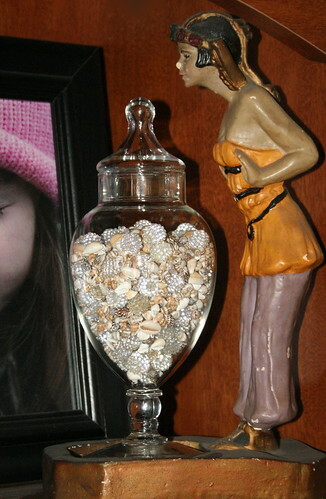 I’d never thought of piling up the tea cups in the jar the way you did. I’m just entranced by the beauty you create.